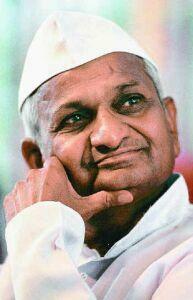 Anna Hazare (Born June 15, 1938) from Ralegan Siddhi, a small village in Ahmednagar District, Maharashtra, is following the JAT way. JAT is not the term used for a caste, rather it is used to portray the attitude, passion, power, courage, hardwork and determination carried by JAT.It is time for all of us citizens to contribute in whatever little way we can in this fight against corruption being led by the elderly 74 year old ex-soldier Anna Hazare. As a token or gesture of our support to this anti-corruption movement. Even a small gesture counts a lot and will go a long way. Kindly spread the message through sms and emails to all your acquantances. Helping the Anna Hazare in fighting for a cause to regularize the Lokpal bill would help eliminate the corruption to some extent. The Lokpal bill gives the power to file complaint of corruption against PM, CM, MP, MLA, Ministers, CJI or anyone with the Lokpal. The Lokpal bill was first presented during the fourth Lok Sabha in 1968 and passed there in 1969, however while it was pending in Rajya Sabha, the Lok Sabha was dissolved which lead to the failure of the bill. Some say that politicians/britishers have divided the country in various castes for the vote bank and their benefits, however the country should be categorized as Good and Bad, Well to do and needy categories. All the higher and good class ones should take-up one from the other category and help them live their life conveniently. Each and every community is fighting for some cause these days and poor govt. get on its knees in front of any people who could give them any kind of profit. This is the fight against corruption, and major issue every Indian is worried about, so we are with Anna Hazare and his movement. Anyone comes in opposition is in some way or other corrupted, so lets see who all are opposing and whom we should elect in next elections. We are sure it would be achieved sooner than later.